We’ve used the waste we produce to be taken away by the garbage collectors on regular basis. 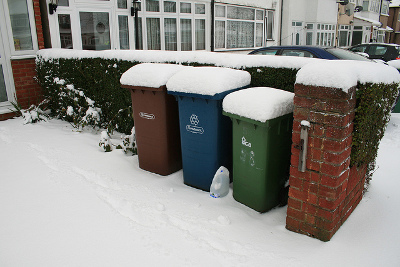 But winter weather could be unpredictable, and heavy snow could delay junk and recycling collection with days. So, do you know what to do in a situation like this where your garbage could not be collected for days due to sever weather? Yes, you could stop produce any waste, and this will benefit the environment, too, but there are a few simple measures you could take to ensure your garbage is properly stored until it is safe for your rubbish removal service provider to come and collect it. Use black or darker garbage bags since they will not blend in with the snow, and will make it easier for the waste collectors to notice and collect them. Plow the snow from the road to your garbage bins to ensure that the garbage truck can reach them easily. Make sure you haven’t blocked the path to your junk with excess snow, so it can be safely and easily accessed and collected by the garbage men. Always close the lid of your container to prevent wet items from freezing. A frozen dumpster is difficult to be emptied efficiently and waste could remain in it after dumping. Use double bag packaging for your food waste, disposable nappies and other kind of perishable waste to prevent leaks and bad smell. Remove any non-perishable or recyclable waste from your green bin to allow more space for food waste or disposable nappies. Wash out excess recyclables and securely bag them. This waste will not rot or smell, therefore it can be comfortably stored until your waste carrier resumes their collection rounds. Make use of your home compost bins for fruit peelings, vegetables, tea bags, food boxes and paper if one is available to you. If possible, take your excess waste to the nearest household waste recycling centre on your own. Still, check the centre’s website to make sure it is open. Follow the tips and tricks above to ensure your safety and the safety of the ones around you when it comes to the disposal of your waste during winter months. This entry was posted in "24/7 Waste Removal Tips" on Saturday, February 6th, 2016 by 24/7 Waste Removal.